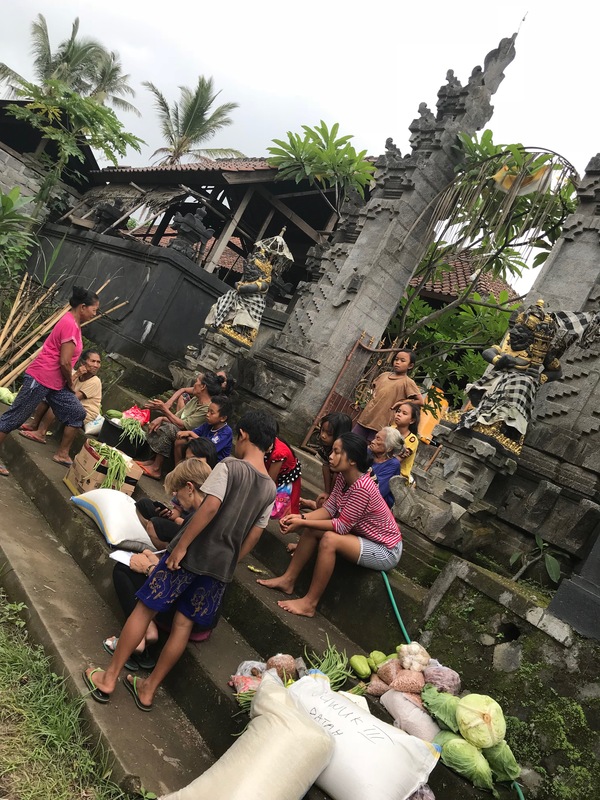 I remember as I was announcing I was leaving my job and Seattle to head to Bali, there were a couple people who said the same thing: “You know, living somewhere is very different than vacationing there.” It was usually a cynical tone and it always planted a teeny seed in my mind that maybe I’m making a mistake. That maybe I’m living in some fairytale in my mind and it’s not a good idea to move to Paradise because it’s not actually paradise. The first few weeks I was in Bali, I was vacationing. Eating delicious food, checking out different beaches, and swimming in all the fancy pools throughout town. I was drinking tropical pineapple cocktails, paying $5 for a massage, and getting a dark tan. But after a while, I must be honest and say that there were times I actually got bored. Since I only knew a couple of people in Bali, my WiFi was nonexistent in my room, it was too hot to go on long walks, and I didn’t want to spend money, I was very limited on what I could do. I can only read and write so much… I became a master at Bejeweled, took many showers and naps to kill time, and had that damn voice, “you know….living is very different than vacationing” running through my mind constantly. Those cynics were right. During vacation, you jam-pack your time with excursions and relaxation because you only have a certain number of days. But living? If I didn’t visit the beach one day, I could just do it the next day. 12-15 hours every day to myself. Thus, boredom struck. Friendships started growing, scooter rides became longer, and a sense of community was forming. Then to really create a sense of comraderie with Amed, Agung started talkin’. No more boredom. What has been occupying the majority of my time these days has been helping out in the community. I’ve shared many experiences about kids yoga with my favorite kiddos (loooooooove them!). 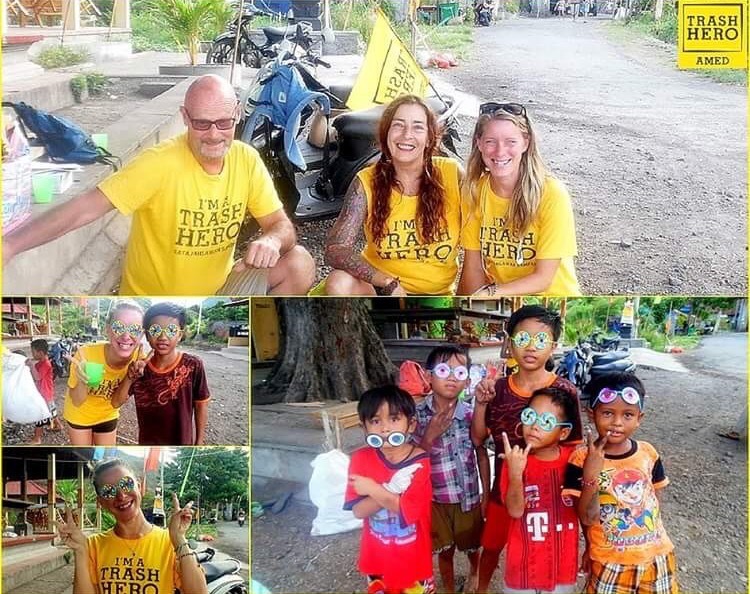 But there are a couple other organizations I’ve been helping with – one is called Trash Hero Amed. Each week we select a different beach to pick up all of the trash. Unfortunately, the trash situation here is abysmal. There is garbage EVERYWHERE. So it feels really good to clean up a dirty beach with and for the locals. 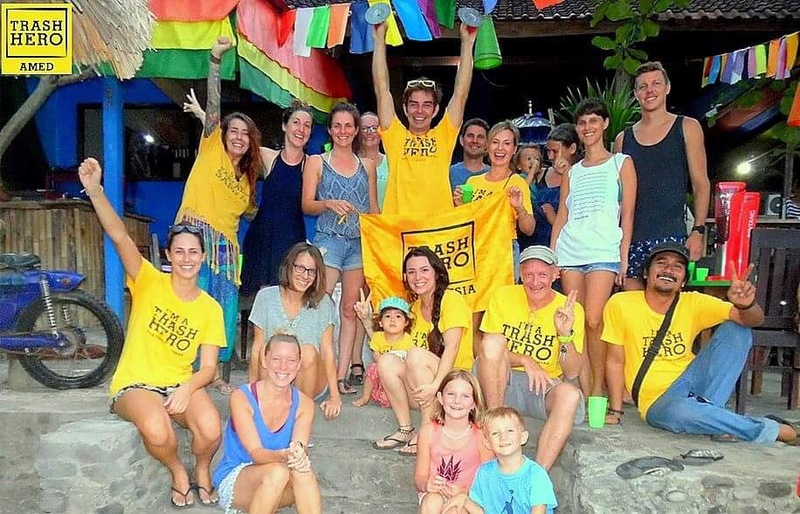 Kids Yoga and Trash Hero – happy to contribute my energy to make Amed a little bit better. Amed Bali First Aid P3K. It has been one of the most eye-opening and impactful experiences of my life. 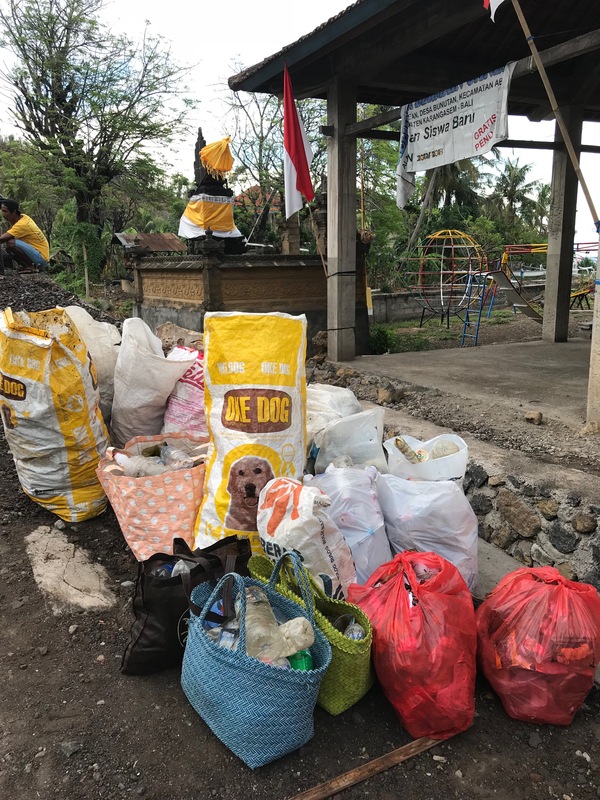 With Agung’s ‘imminent eruption,’ thousands of people have been displaced from their homes. 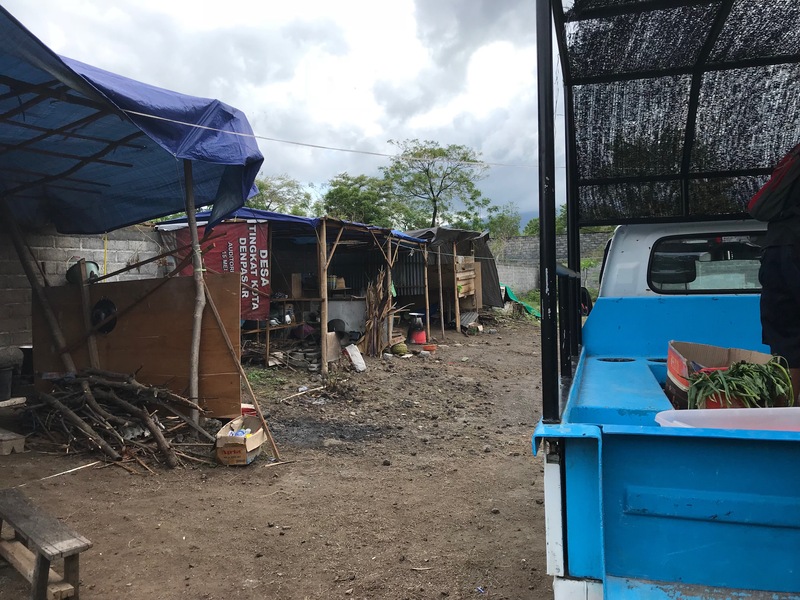 Hundreds of families have been evacuated from their villages and moved further away to avoid destruction from the big eruption. 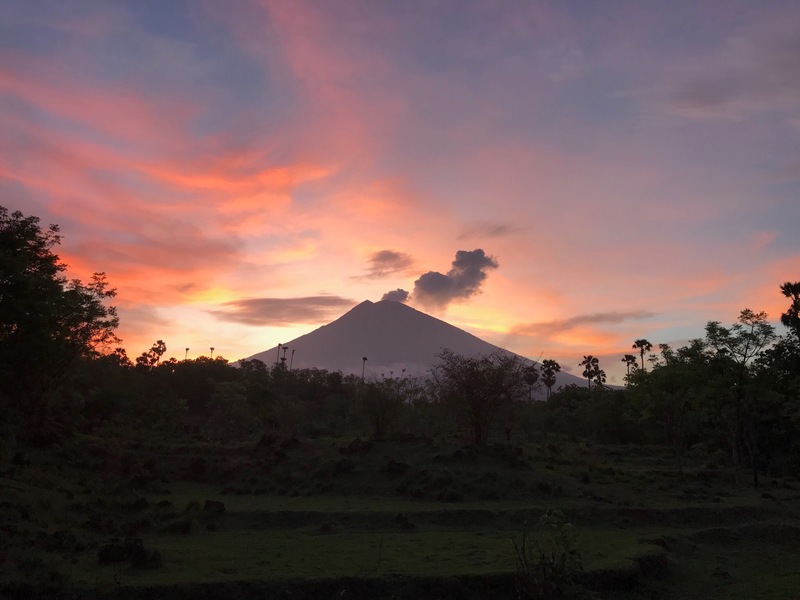 Can you imagine having the government tell you to leave your home, sleep on concrete, eat dirty rice, and wait for Agung to erupt? 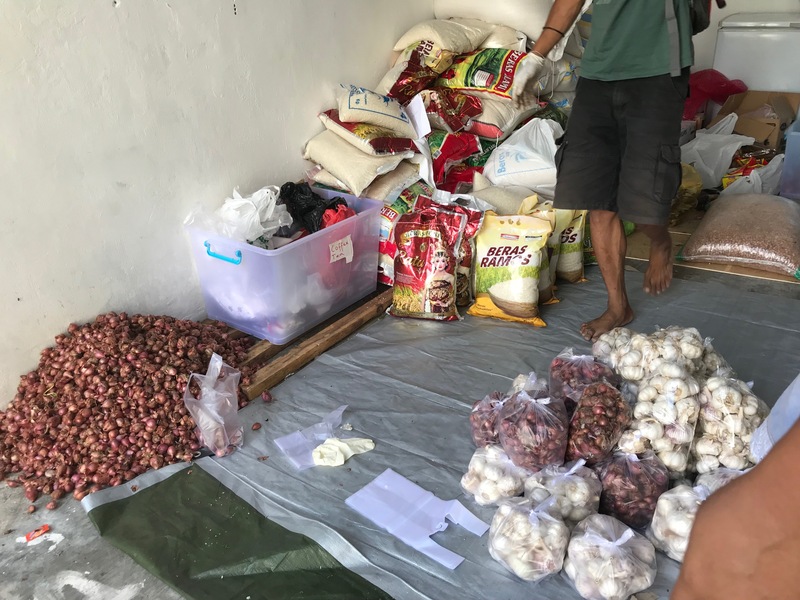 The government doesn’t really do much to aid the evacuees, so a team has formed to gather supplies, food, water filters, and anything else a village needs to be safer and more comfortable. There are dozens of refugee camps and this group is involved with each of them, bringing them supplies and smiles. 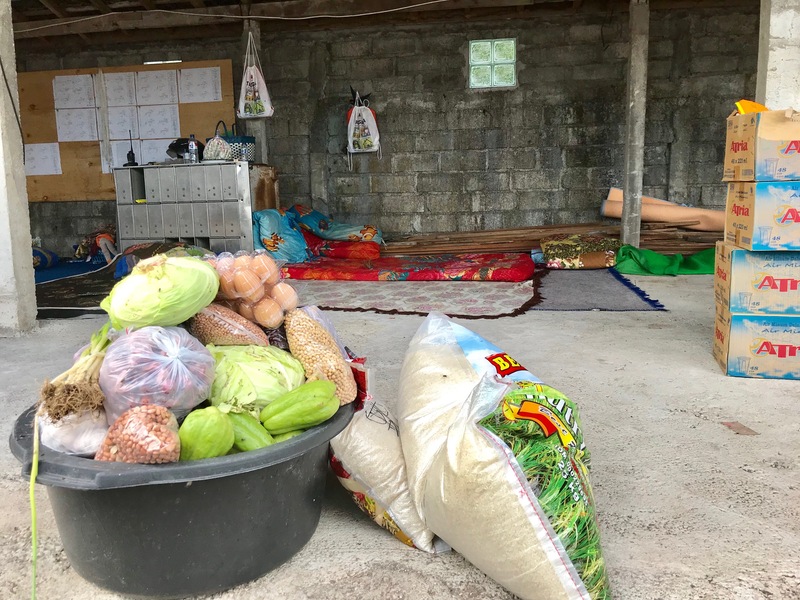 In the morning, a small group gathers at a pop-up food bank, sorts food/supplies, and organizes which camps we will be visiting each day. In the afternoon, we deliver. This is what many of the refugee camps look like. 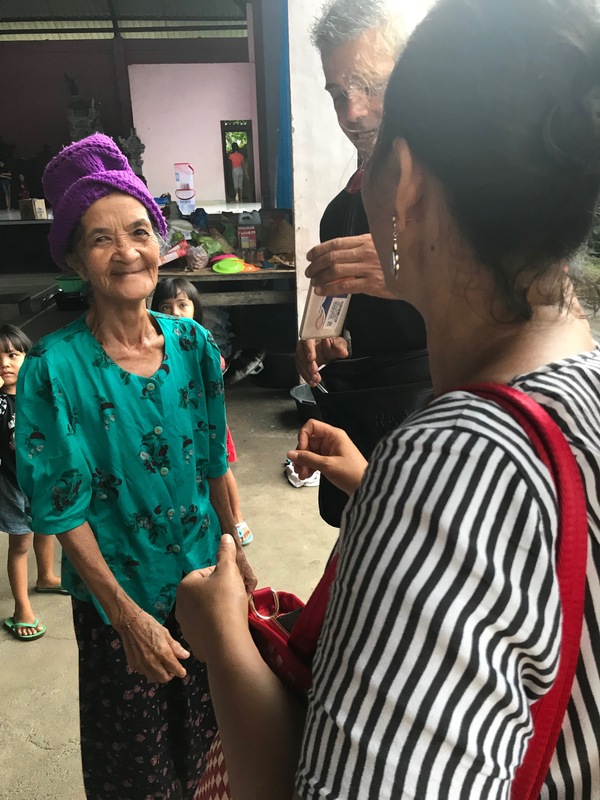 Thanks to some generous donors, the organization has received food and supply donations each day that are making a huge difference. This is about $200 worth of donations. Rice, cooking oil, eggs, coffee and sugar. 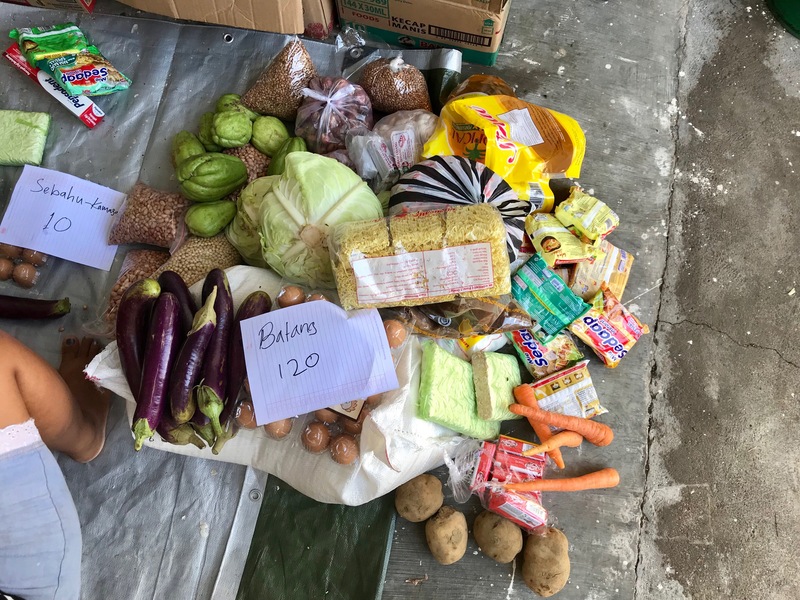 This food feeds an entire camp of 120 people. Less than $100. 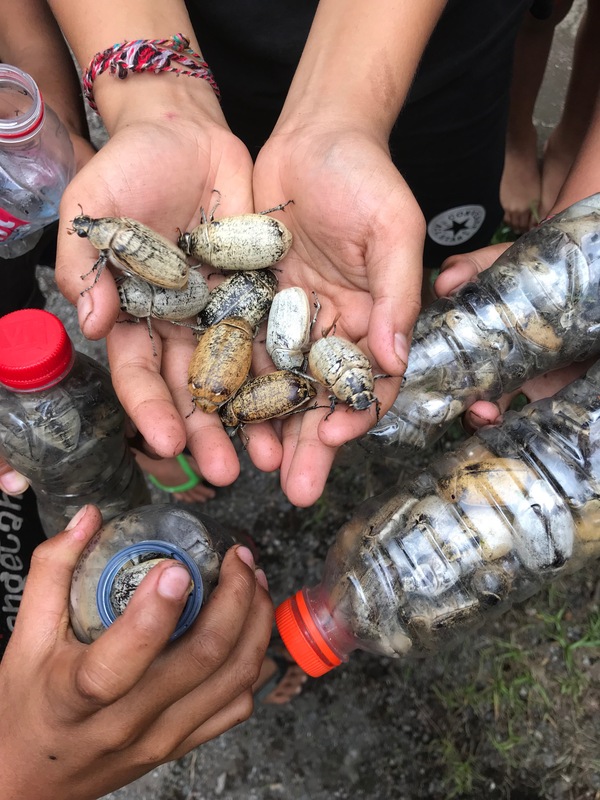 At one camp, some of the kids showed us the bugs that they catch and eat for meals. Hoping to bring better sleep, better meals, and uplift spirits with each visit. It’s amazing how far a dollar can go. 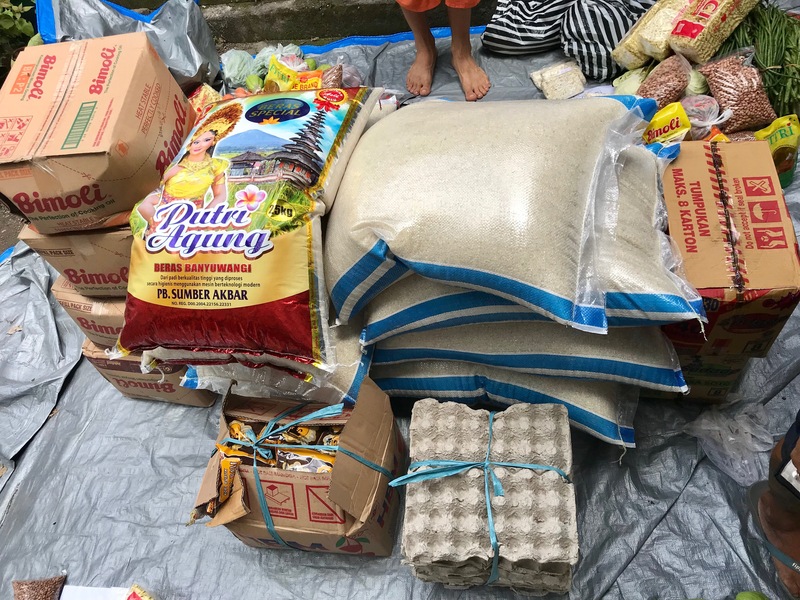 Even $10 can buy a large bag of rice that feeds multiple families. 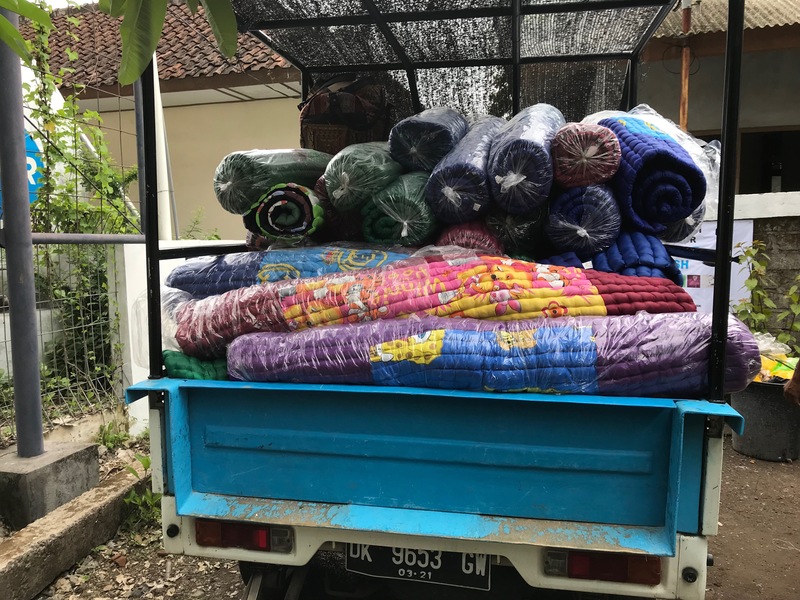 I have been blown away with seeing the donations come in, the purchase of the food and supplies, and then the final delivery. No middle man, all volunteers, all for the refugees. Paradise is what you make of it. Mo, you have such a beautiful way with words. Your stories are so uplifting and I’m sure touch so many people even though we’re thousands of miles away. Do you have a mailing address now? We are with you Andrea!! We are in this one year now and it is amazing!! Sending love from Mexico!